We’ve heard these terms since we were children, spoken by the adults around us to describe their lower back pain, their sciatica, their plantar fasciitis. Which makes one wonder — if we have this somewhat shared vocabulary for expressing pain and symptoms, could there be a shared ‘visual’ vocabulary for symptoms and sensations? 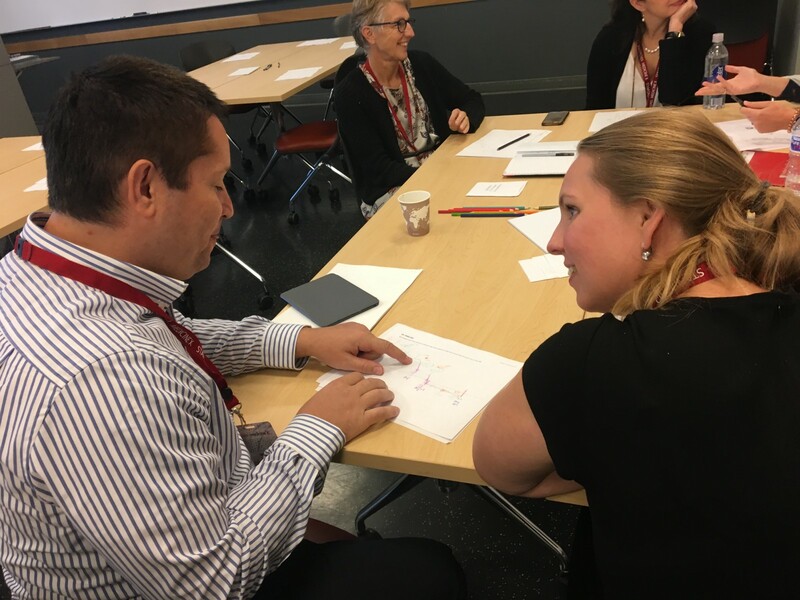 Our workshop was called “Co-creating visual conversations: using imagery to augment patient visits.” The diverse group of attendees included about 25 patients, designers, healthcare practitioners, and an assortment of other healthcare folks. 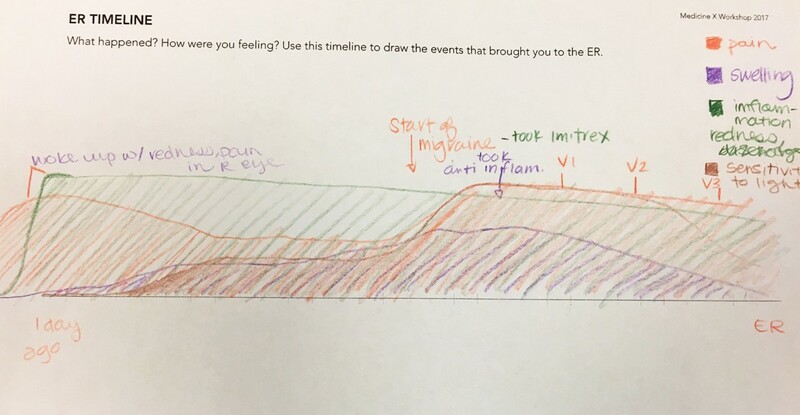 We led them through some exercises intended to visualize a memorable ER visit, using a timeline and ‘symptom map,’ along with wellness information like diet and physical activity. 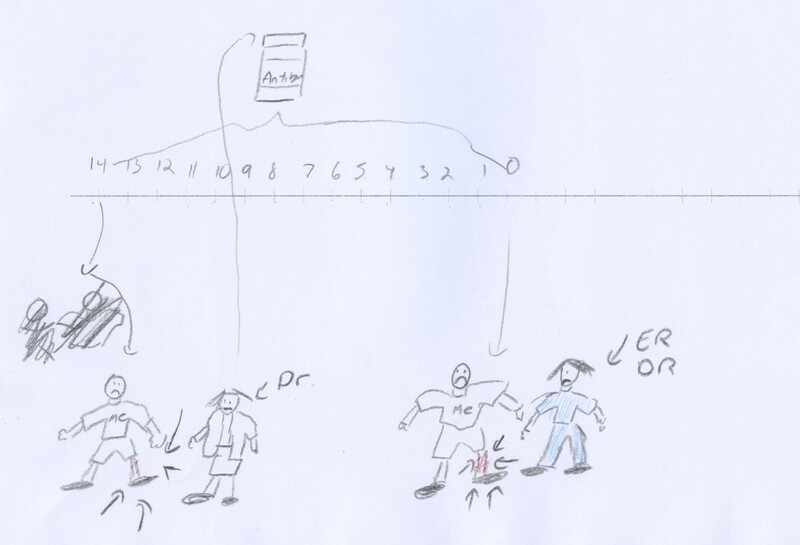 Of these activities, the ER visit drawings were especially interesting (dare I say exciting?) Trends and themes emerged across the different images, and these are outlined below. The exercise: Recall a memorable ER visit. 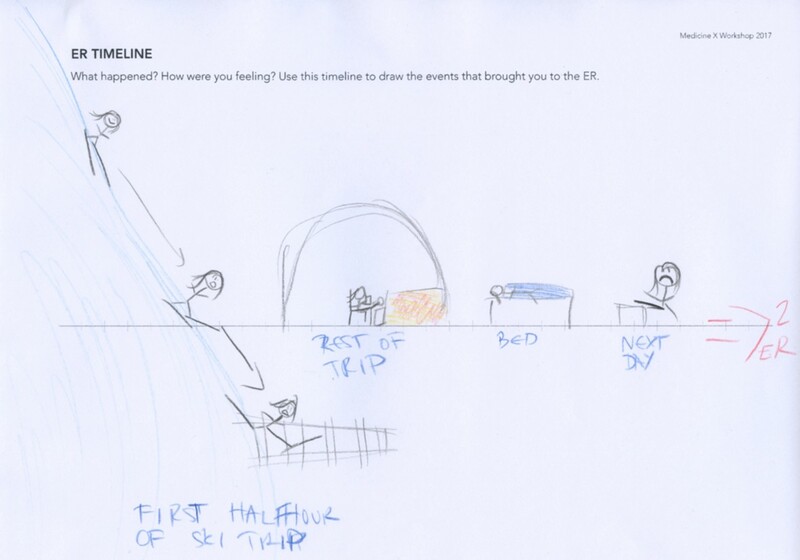 Create a timeline of what happened leading up to the visit, along with a drawing of how your body was feeling. The purpose is to help medical staff understand what happened. Then share your drawings with a partner. This timeline stands alone pretty well, even though it’s only words. 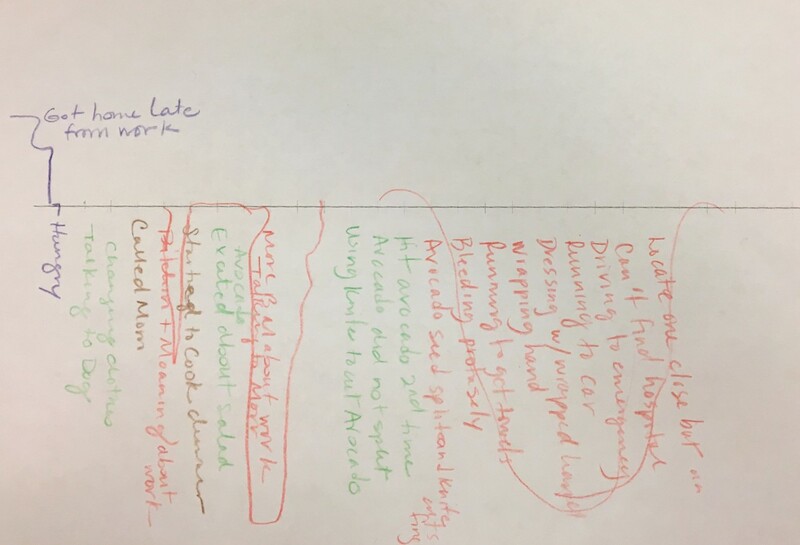 This person is mixing words with different colors; red words combined with a red line graph show when things took a down turn. Green, purple and brown words show other events/context. What can we learn? The timelines created with words take a little more time to visually absorb, but they stand alone well after the fact. (Even though I didn’t hear these stories firsthand, I could understand what happened when I looked at them later.) The line graph adds a nice visual component to supplement what the words are saying. 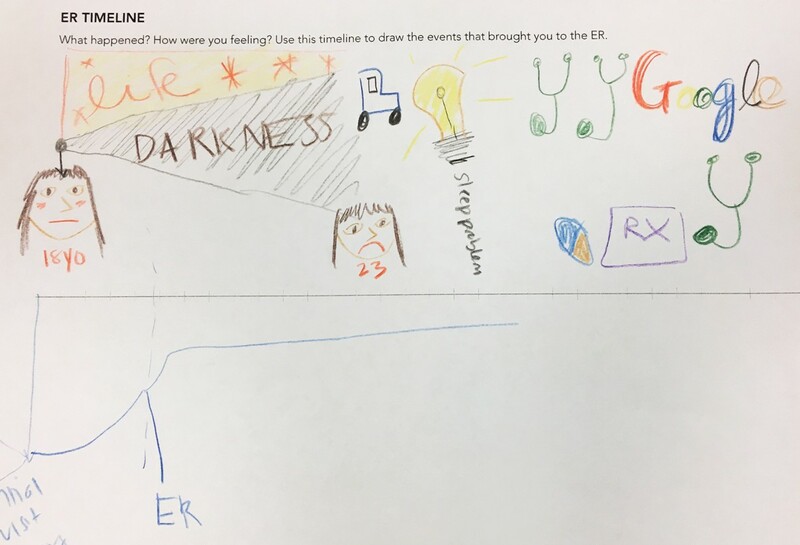 This timeline uses drawings to show an injury, seeing a doctor, getting antibiotics, then going to the ER and OR to get treated. First half hour of ski trip! Bummer! 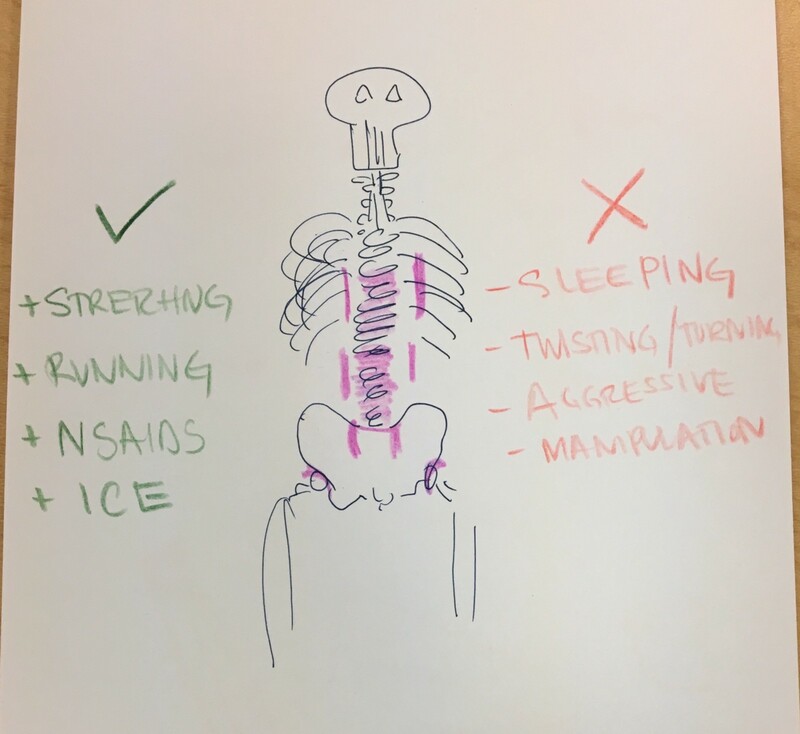 This person drew how they were injured and then spent the rest of the trip in bed, then went to the ER. I liked that they used the whole paper to show the ski hill. What can we learn? 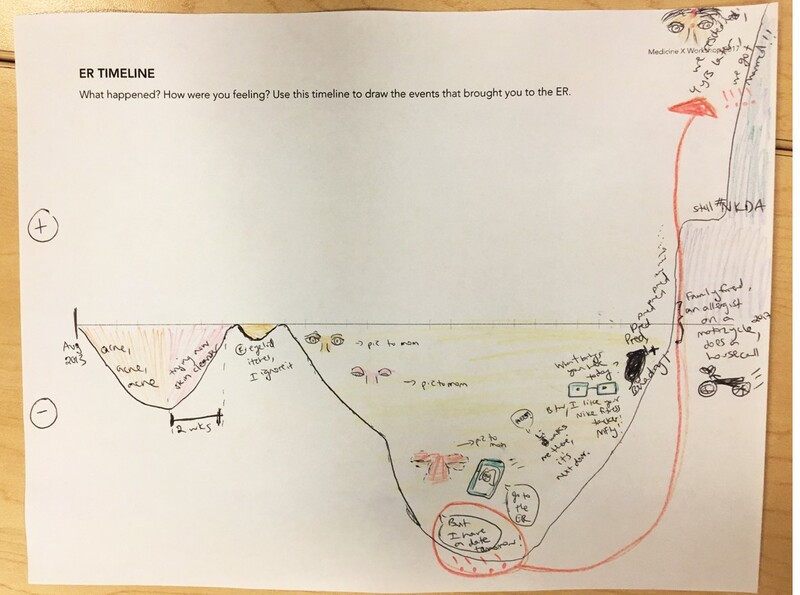 Timelines created with mostly pictures can communicate a lot, though they leave more room for interpretation and so would require an in-person walk-through to make sure the finer points are understood. What can we learn? A good balance of pictures and words can make a story engaging and also help it stand alone after the fact. 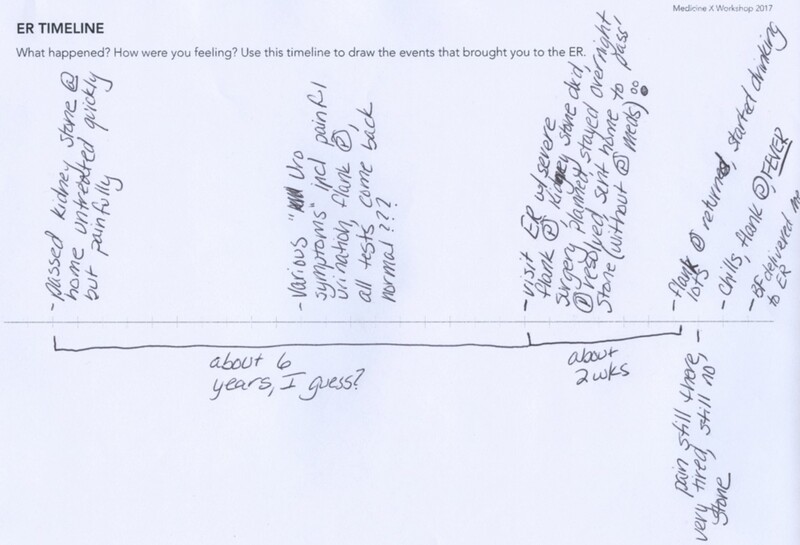 Many of the timelines used a graph or ‘emoji face’ to indicate how they were doing at a given point in time. 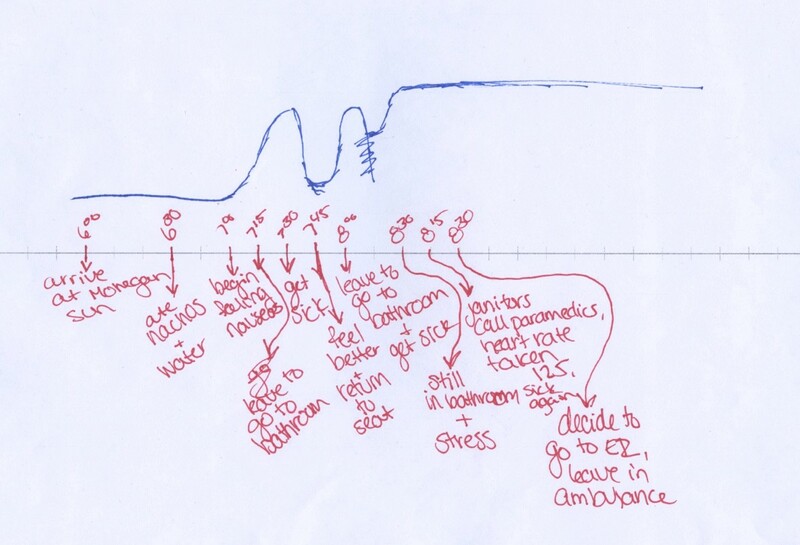 In this image, the y-axis of the graph represents the ‘size’ of certain symptoms at a given point in time. 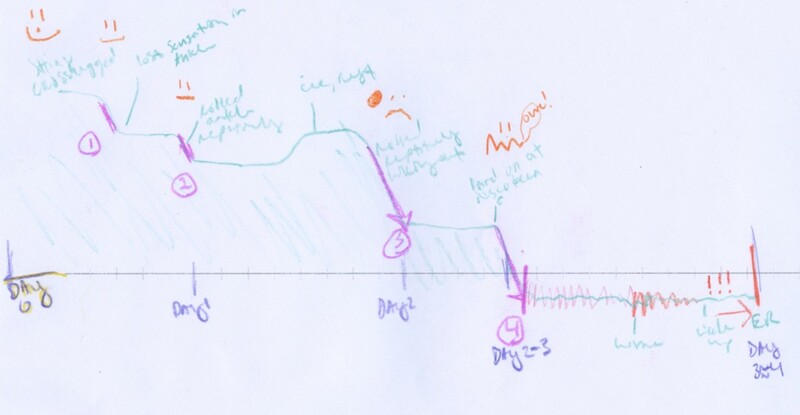 This person used a line graph to indicate how they were doing — up is good, down is bad — along with faces and exclamation points to communicate their condition worsening over time. This was an interesting example of heavy use of face/emoji representations over time, paired with words and other small drawings. What can we learn? People think graphically about their wellbeing, but their mental models differ — some used a line graph with higher=feeling good and lower=feeling bad, while others used an area graph with higher/more area=feeling worse and lower/less area=feeling better. (Yes this is a confusing sentence — refer to the images above to see what I mean.) 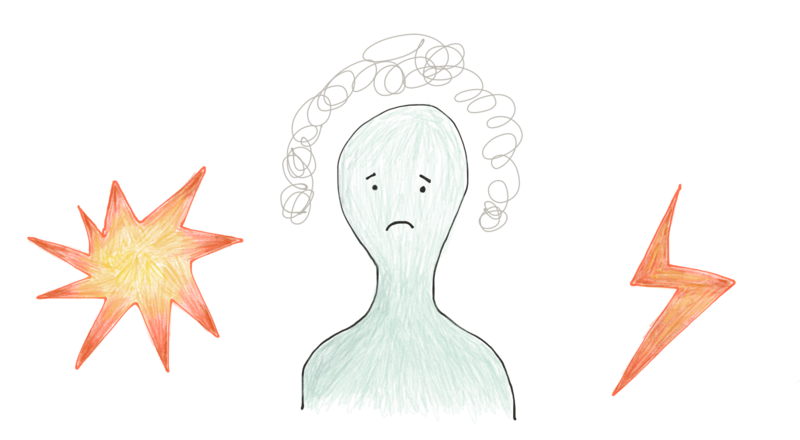 Other people wanted to simply use facial expressions to reflect how they were feeling. This person is using an area graph combined with words, pictures, and facial expressions to show what happened. I liked that they used so many different strategies in their approach. 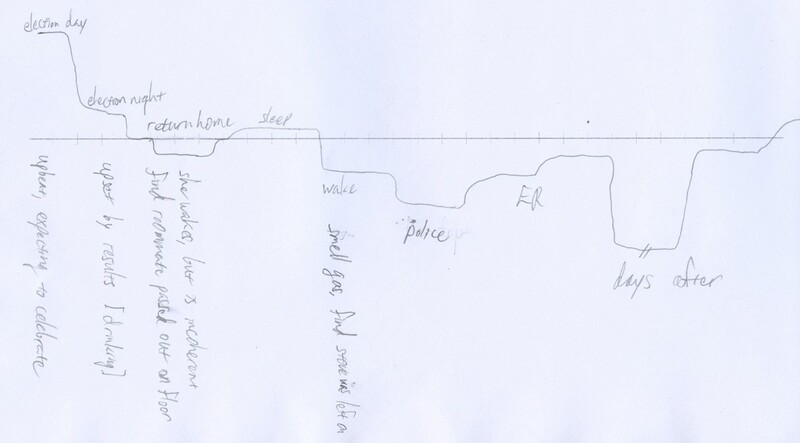 As quick, hand-drawn timelines, many of these required both a verbal and visual component to be well-understood. It would take more work and time to create something that could stand alone and be legible after the fact. But in this ER visit scenario, a quick and scrappy timeline might serve the purpose just fine. I’m going to start with the most obvious one, but it’s worth laying down — you’ll see this over and over through the rest of the examples. Star polygons and lightning bolts combined with red-orange-yellow indicate sharp pain. The lower left image shows swirly patterns inside — perhaps this is meant to be a colon? This interesting drawing seems to show skewers in the head, along with pain in the left eye. What appears to be a delicious slice of pizza in the middle I’ve just realized is a shining light…so this might be a migraine image. 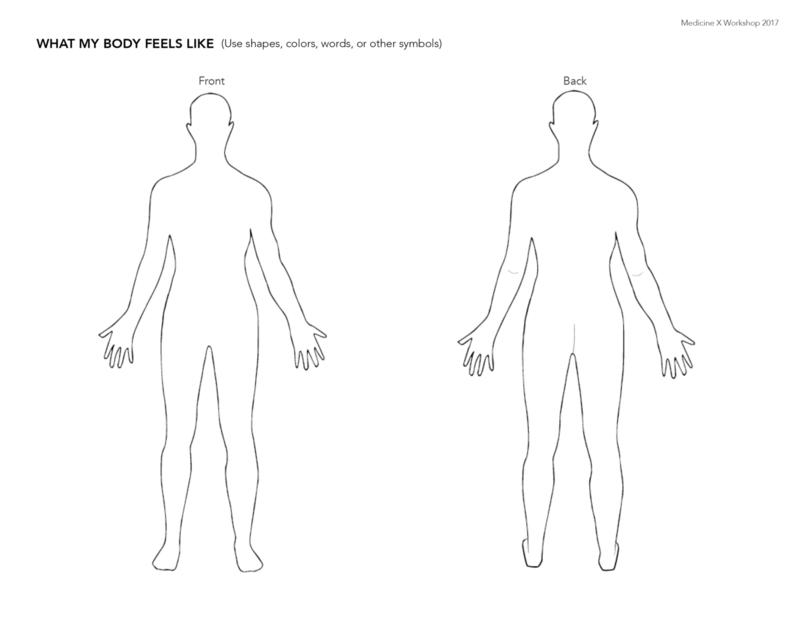 The image on the left shows cross-hatching on core muscles; the one on the right is showing a tight back/back pain. Some people drew organs, like lungs, on the body. I find this interesting because there are not as many metaphors for the sensation of not being able to breathe; so drawing the lungs is a reasonable way to explain what’s going on. Both people drew lungs as pink — very literal. The one on the left drew yellow liquid in the lungs. The image on the left shows a lower back cut open with a sharp knife and flames coming out. The cube on the right seems to communicate tightness. Looking at the images together, another trend surfaces; some people tended to color the entire body in a ‘cool’ green or blue hue, to indicate that that part of the body was fine. Cool colors indicate calm, while warm colors were used to show when something was wrong. The lines seem to indicate a feeling of alarm, worry. The person on the left is clearly not happy. The one on the right is happy enough but has a lot of questions. This is a fascinating way to think about pain. 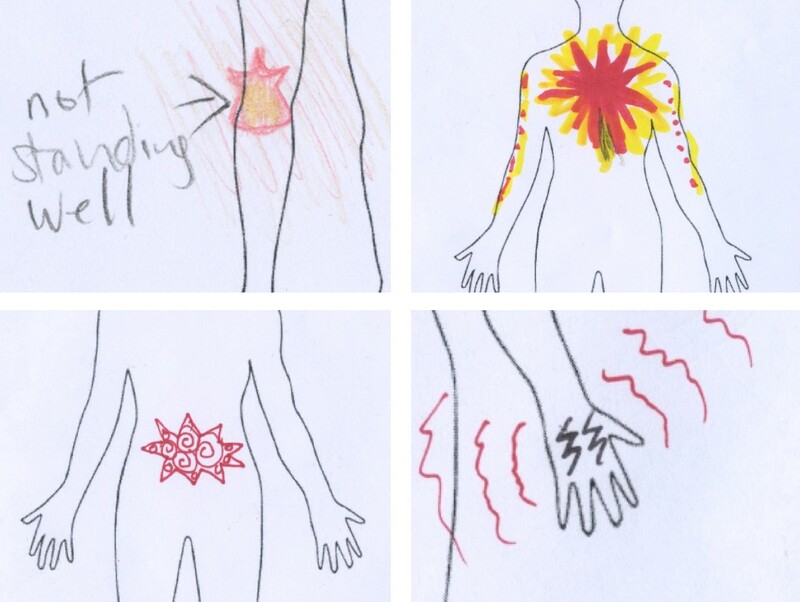 It makes me think — what if people could draw or paint on their actual bodies to show how they were feeling? 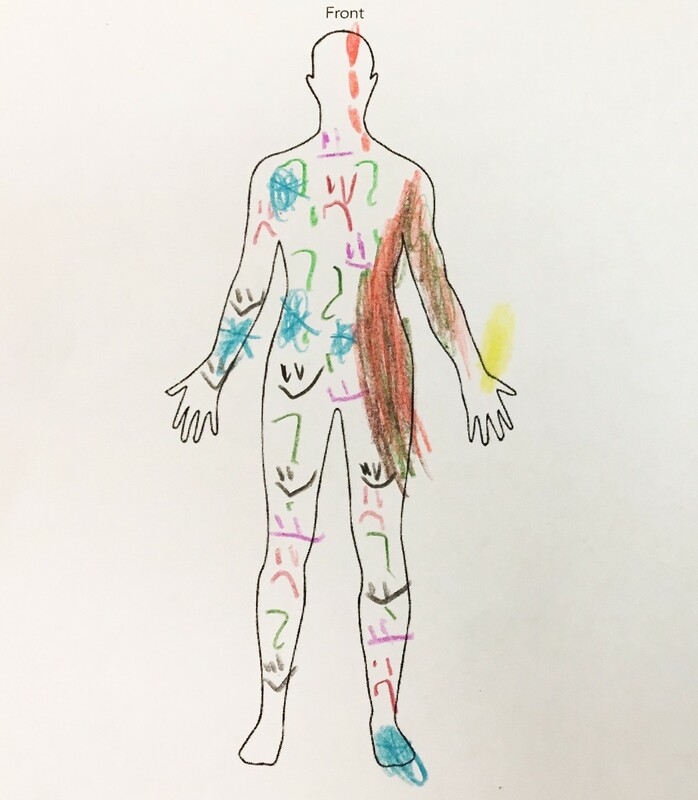 Note the colors — sweat is blue, vomit is green, the wound is red. It was fascinating to see how two different drawings of a urinary tract infection; the drawings have different colors but overall are very similar. Both include fever, lower left back pain, and pain while urinating. 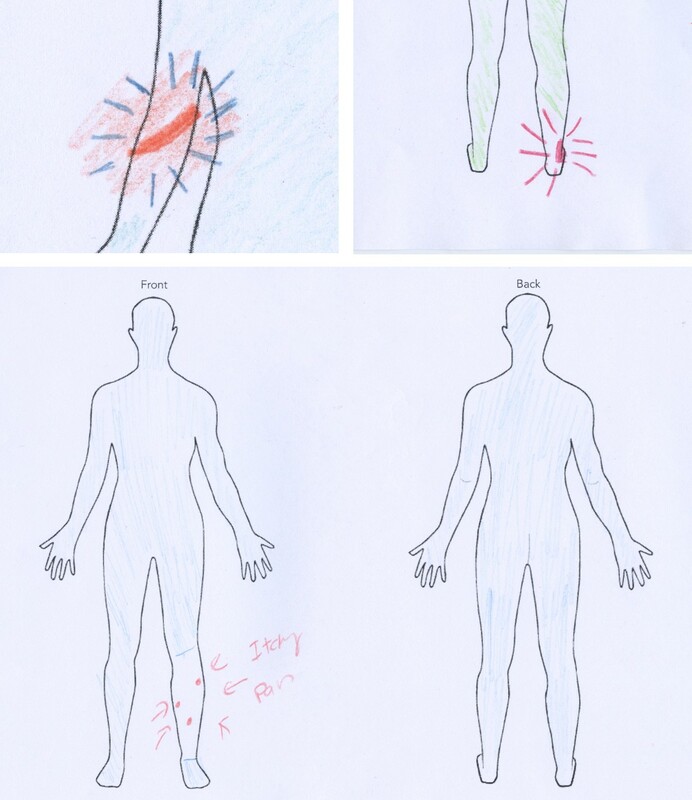 It hints at the potential of drawings to assist with diagnosis; what do given conditions ‘look’ like, on average, from a symptom/sensation perspective? People liked telling and hearing stories visually. Even though we asked people to get into pairs and tell their stories, they wanted to hear the stories of everyone at the table. Mapping it out helped people not forget the details of their story. On a timeline, allow for visual (pictures) or narrative (words) input. Allow a mix so that people can use whatever mode of expression works best for them. 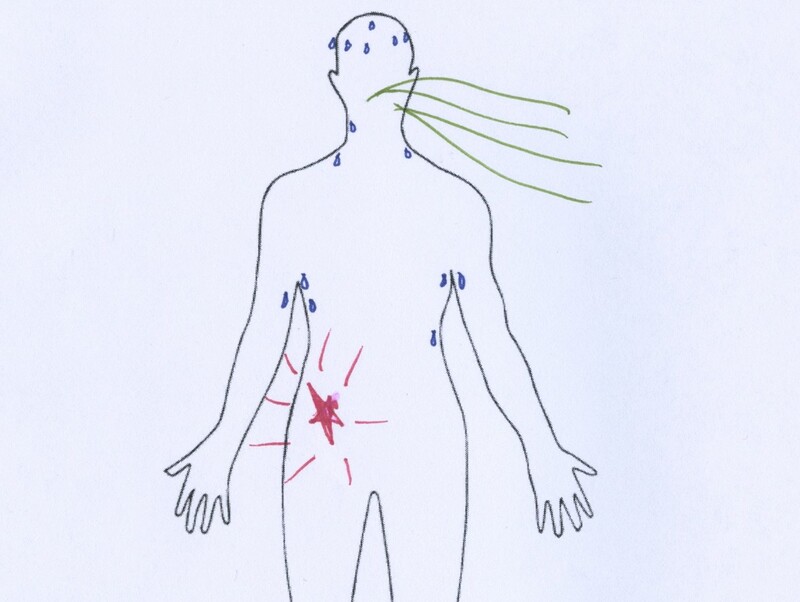 For symptom visualization, consider pre-existing shapes (sharp, dull). The color red is very important; allow a range of colors. Allow symptoms to appear outside of the physical body — things like mental states are often visualized outside of the head, and body outputs like sweat and vomit (and others) are important to consider. Allowing free-form shape creation and input will result in more creative and personalized expression. 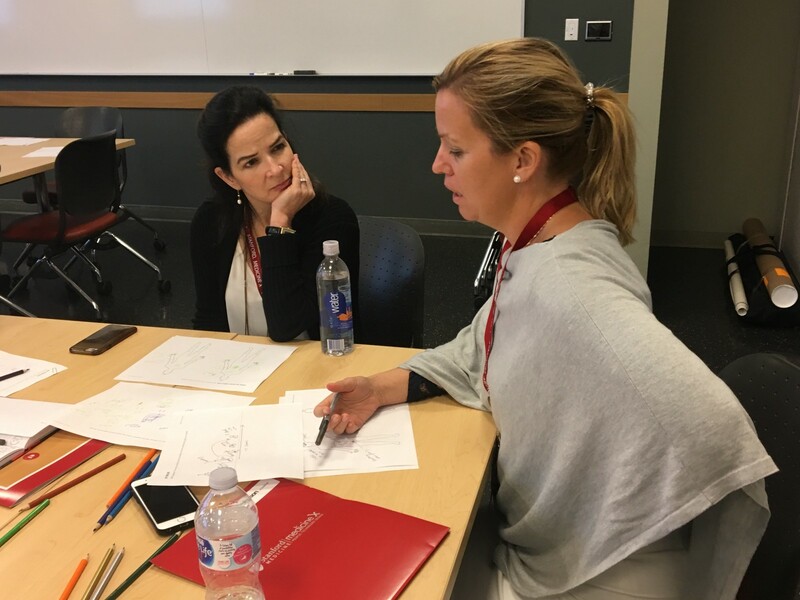 It was a great pleasure, honor, and thrill (if I’m being honest) to help lead this session along with Chethan and learn from the participants. I’m grateful to all the folks who allowed me to use their images here. Hopefully this information will be useful for others who are similarly striving to make healthcare more visual. 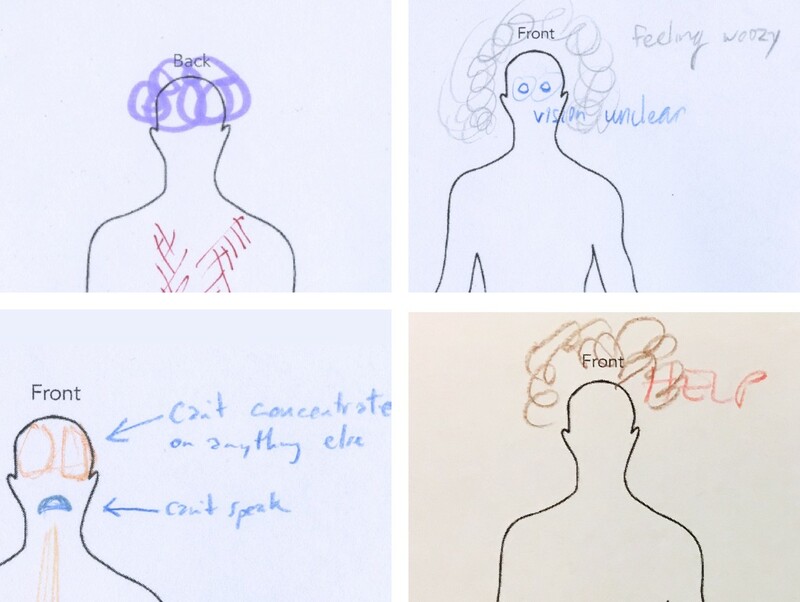 Are you working on a related tool or product to help people visualize their health? I’d love to hear from you — drop me a note in the comments or reach out.